This is a fun little project I created using a SVG file from Cutting Cafe. They have such sweet files, and I attached it to a plastic Starbucks Coffee Cup. 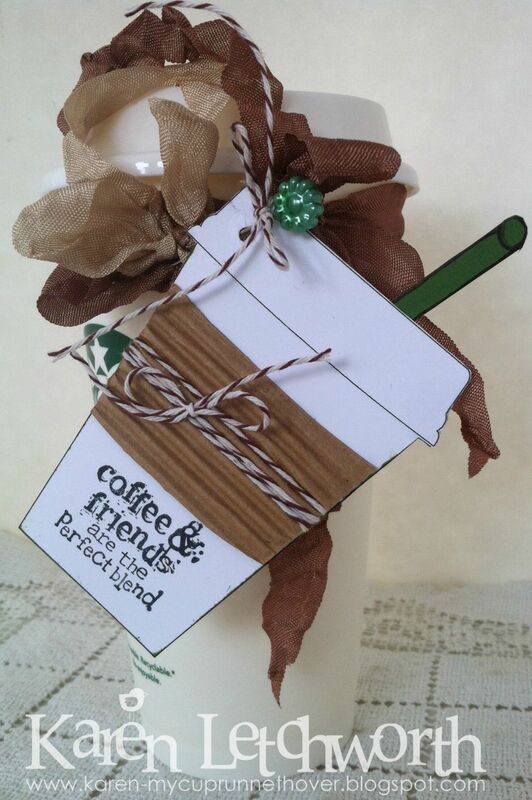 I used a corrugated paper to wrap around the image, cut my straw from green paper (just like a Starbucks drink), and added some crinkle ribbon from DL ART Coffee Bundles, as well as their brown twine. A little green stick pin holds the cutting file cup to the actual coffee cup. It makes me crave a coffee just looking at it! Coffee Loving Card Makers - Coffee Lover's Blog Hop - What a AMAZING challenge. I couldn't resist playing along. How fun! Simon Says Stamp Wednesday Challenge - Simon Says, "No Designer Paper"
Unruly Paper Arts - September Reader Art Quest - Coffee and Cream - How perfect, and how fun! Thank you for stopping by. I really appreciate your visit to my blog to take a peek at my "Coffee Lovers" project. I am SUCH a huge Starbucks fan that I'd actually be embarrassed to tell you all how much I spend on this habit of mine. Gratefully, my husband supports my habit(s) and loves coffee, too. Beautiful coffee themed tag! This is a terrific idea! Love the colors and the look! Love your project! It's like a real Starbucks cup, right down to the straw! Love the corrugated sleeve on this coffee cup with great sentiment! Happy hopping! This is gorgeous Karen - love how you have decorated the container :-) - Almost makes me thirsty, but I don't drink coffee this late in the day. Oh fun. Love the corrugated cardboard! What a great project, Karen! Love how you attached it to a real coffee cup - the sentiment is super sweet and the ribbon is just scrumptious! I love this! I hadn't heard of Coffee Loving Card Makers, so thanks for the lead. Blessings! love this! love the green stick pin! this is fabulous, Karen! and yes, it makes me want to race over to Starbuck's right now! grins! Love this perfect to go cup design! Great tag! Love the ribbon! Lovely card. I like that you created a shape card. What a fabulous tag, Karen, just perfect for your cup! Happy hopping! Such an amazing coffee shaped tag!!! Love all of the gorgeous color and texture! LOVE! This is one of the best I have seen - love the use of the temporary cup and the hanging tag - awesome! Perfect interpretation of the Starbucks coffee! Love it so much! So glad that you join the fun over Simon Says Stamp Wednesday “No Design Paper” Challenge! Love the tag!!! Awesome! I recently used a cutting cafe file! Love it and I will checking out coffee tag too! Beautiful, love how you showcased the crinkle ribbon. Have a blessed day DIANA L.
This is really great - love that it can be given as a gift. Your project is fabulous, Karen! LOVE that crinkle ribbon. Your tag is beautiful. LoVe it. Thanks for sharing. Happy Coffee Day! A coffee cup shape tag for a coffee!! So very cute!! Such a wonderful way of giving gift, Karen. I love everything on your tag! fantastic cup tag and that ribbon is an awesome touch. great project! Wow - I LOVE everything about your card!! Thanks so much for sharing your talent! I love this cute little tag!! Beautiful and the ribbons look perfectly in place! wow, what a unique tag...love how you presented the ribbon wrapped around the cup. Super cool.